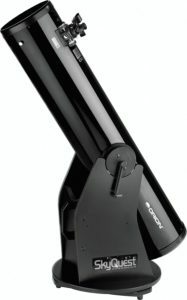 The Orion 27194 Skyquest XT8 Dobsonian telescope is a one of the most popular telescope models around. For the price, it’s a massive item, weighing an impressive 41lb, with a 1200mm (46.5 inch), focal length, and a 203mm (8 inch) diameter mirror. This Classic Dobsonian telescope is a really easy to use design, consisting of a tube with eyepiece near the open end, (like a Reflector telescope), but instead of a potentially complicated Equatorial mount and tripod, the telescope is attached to a sturdy base plate. The major pieces can be easily separated when you need to move the telescope, using two strong springs, that Orion call their ‘CorrecTension Friction Optimization’ system. These just hook the two parts together, and make the Orion Skyquest XT8 a truly portable system despite its’ size. The springs provide the perfect amount of tension on the altitude bearings to keep the tube in line with the objects you are looking at, so even if you change eyepieces or lenses, you do not need to re-adjust to find it again. Dobsonian telescopes are moved by simply moving the tube around by hand, Teflon and plastic bearings making the action very smooth and controllable. With the centre of gravity always above the axis points, the telescope remains stable, no matter where you are pointing it, and it also helps to reduce unwanted vibrations which can ruin your view on lesser telescopes. The big 8’’ mirror gathers plenty of light to give you fantastic views of planets, galaxies, and nebulae, which a 6’’ mirror would struggle to see. Mars Jupiter and Saturn can all be seen in stunning detail, and even Jovian Lunar Transits can be seen, when a moon of Jupiter casts a shadow across the planets surface. The Orion 27194 Skyquest XT8 comes as a kit of parts, that are easily assembled without any mechanical knowledge needed. If you can use a screwdriver, you can assemble this telescope. There are detailed instructions that take you through each step, and videos are available that make it even easier. A range of accessories are provided, all of which will help you to get set up very quickly. 25mm Eyepiece with 49x magnification. 9mm Eyepiece with 136x magnification. Detachable Finderscope for lining up the telescope. Collimation Cap for mirror alignment.